The Brunei Sultan Omar Ali Saifuddien Mosque in Bandar Seri Begawan will be celebrating its golden jubilee this year. It will officially be 50 years old on 24th September 2008. It was officially open 50 years ago on that date. The mosque is currently undergoing restoration and a lot of tourists are unfortunately unable to take a good photograph of it. The mosque is actually based on Moghul architecture and hence the similarity of the design of the dome with that of the Taj Mahal in India. Anyway, I have managed to acquire very recently a first day cover issue on that day. It was sent by a Mr YF Chin of the Telecommuncations Department in Brunei to a Mr Fong Pang Loi, presumably his friend at Posts and Telegraph of North Borneo in Jesselton (today's Kota Kinabalu). The first day cover will soon be 50 years old too. 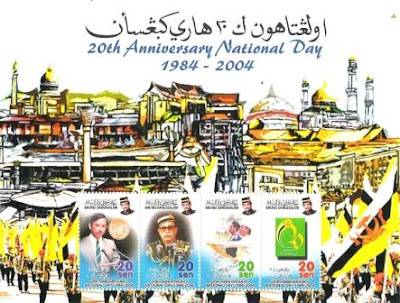 Yesterday was Brunei's 24th National Day celebrations but being the 24th is not significant enough for a special philatelic issuance. The last time anything interesting was issued was for the 20th National Day. Now, next year is the 25th Anniversary, expect something. 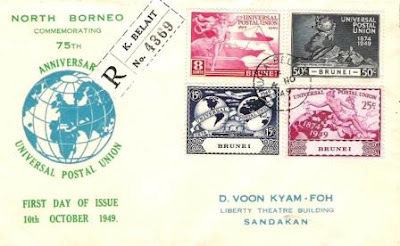 By the year 1949, Brunei had issued only a handful of stamp designs - the 1895 Brunei Local, the 1906 Labuan Overprints, 1907 to 1947 Brunei River Scene and additional Kampong Ayer scenes. In October 1949, Universal Postal Union was celebrating its 75th Anniversary and all countries around the world issued their own stamps to commemorate it. Around 70 countries and territories of the Commonwealth issued a set of identical stamps. The designs were the same for all 70+ territories with the exception of the colours, the postal amount and the name of the territory. 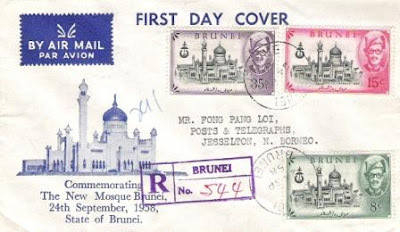 Brunei issued its own 4 stamps. Recently I managed to acquire the First Day Cover which had the 4 stamps addressed to someone in Sandakan and was postmarked 4 November 1949 from Kuala Belait. Here are the 1 Riyal and 5 Riyal which was issued by Saudi Arabia Monetary Authority way back in 1956 to be used by Haj Pilgrims. These are among the earliest of all Saudi Arabian Riyals in paper form. Before that only coins were used. Surprisingly people like it and Saudi Arabia introduced the first proper riyal for circulation in Saudi in 1961. These riyals are interesting as there are other languages on it including Malay. On the reverse, one can read in Jawi that the Saudi Arabia Monetary Authority promises to refund you in full to the amount of one riyal or five riyal as the case may be. My friends in KB and Seria sometimes complained I don't write enough about Kuala Belait and Seria. Despite the fact that I was born in Seria, I have to admit that I don't write enough about my birthplace. You have to remember Seria did not exactly exist prior to 1929 and most of its history is actually Shell's. 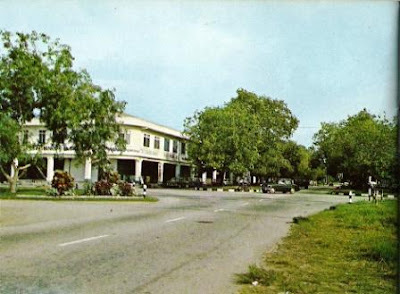 Kuala Belait was also a tiny fishing village and it is Kuala Balai which used to be the capital for the district until oil was commercially produced. KB and Seria has relatively shorter history compared to Brunei or Tutong. 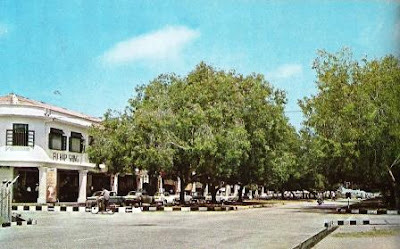 Anyway, I found some old colour photographs of Seria and Kuala Belait which I presumed is taken in the early 1970s. See if you can place them. 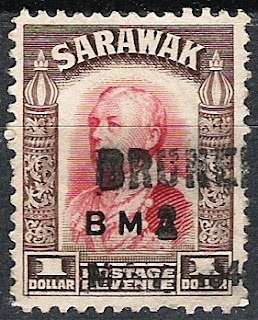 The above is a Sarawak stamp complete with a portrait of Charles Vyner Brooke. Look closely and you will see the word Brunei handstamped onto the stamp and dated sometime 2nd March 1946. For those of you who are both history challenged and postal knowledge challenged would wonder when we used Sarawak stamps in our country? And if that surprised you, look at the stamp below. This is a North Borneo stamp also handstamped Brunei. North Borneo was the name for Sabah, in case you are wondering. What's the story behind both stamps? 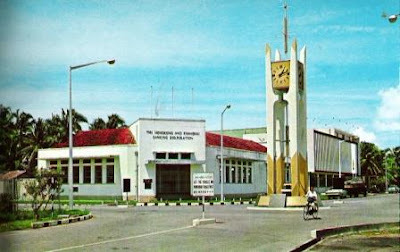 In 1945, when the Allied Forces took over Brunei and the rest of Southeast Asia basically from the Japanese, they set up a temporary administration in all of the countries. These administrations were called British Military Administration and hence BMA. These administrations in starting up the government found that most of the local stamps that were in used at the local postal authorities were mutilated - local stamps being overprinted by the previous Japanese administrations. So BMA in order to restart postal services needed new stamps. In some countries, they were lucky to find existing stamp stocks which had no Japanese overprints such as those in Sarawak and North Borneo. For Brunei, no such luck. And at the same time, in order to simplifly administration, all three states were treated as one. 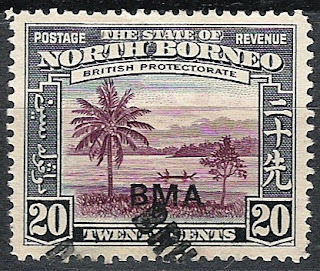 So for a time in 1946, Brunei's postal authorities had to use either Sarawak or North Borneo stamps overprinted BMA and hence, that's why for a short time, foreign stamps were in use in Brunei. I had a hard time hunting these stamps down. Fortunately I managed to get my hands on these two. I also managed to get the entire North Borneo BMA set but at the moment I am still searching for the entire Sarawak BMA set. If anyone out there is willing to part with the entire Sarawak BMA set, let me know. Even though Saudi Arabia had been issuing coins very much earlier, their currency notes did not appear until 1953 and even then it was not meant for full circulation throughout Saudi Arabia. In 1953, the Saudi Arabian Monetary Agency (SAMA) began issuing Haj Pilgrim Receipts for 10 riyals, with 1 and 5 riyals following in 1954 and 1956, respectively. 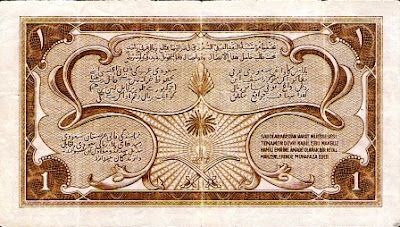 These currency notes resembled banknotes and were initially intended for use by pilgrims who exchanged foreign currency for them. However, they became widely accepted in Saudi Arabia and largely replaced silver riyal coins in major financial transactions. Finally in 1961, the Monetary Agency began issuing regular banknotes for 1, 5, 10, 50 and 100 riyal with the Pilgrim Receipts being demonetized in 1964. 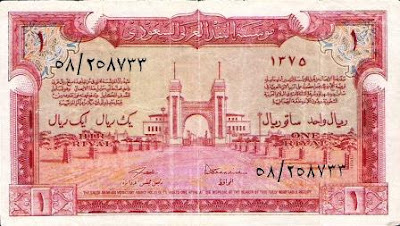 The above banknote is the second 10 riyal being issued in 1954 replacing the first 10 riyal note issued in 1953. I have the 5 riyal and 1 riyal pilgrim notes as well.